Our Creamy Chicken Rice Sides blends a delectably creamy chicken-flavored sauce with onions, carrots, rosemary and garlic to make dishes like our Creamy Bruschetta Chicken a hit at the table. A hearty and satisfying Italian-inspired recipe! Simply combine chicken, mozzarella and a few fresh ingredients with Knorr® Rice Sides® and voila— you’ll have a family favorite in no time! Creamy Chicken Rice is rated 4.5 out of 5 by 125. Rated 5 out of 5 by john81 from Delicious It is really creamy. The spice is perfect and the color lets you want more. 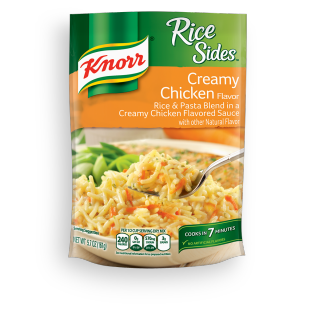 Rated 5 out of 5 by MzFavour329 from Knorr's Creamy Chicken Rice Sides If you are a working mom like me and looking for a quick meal to prepare for your fam, Knorr's Creamy Chicken is it!!! It goes great with baked chops w/ bbq sauce or fried chicken. My kids love it!!! Rated 5 out of 5 by mariah1025 from In love with these they are just the best. They have an amazing odor and taste so good. Rated 3 out of 5 by jessicaje2bd from This isn’t gonna be part of a gourmet meal anytime soon, but it is tasty and the price is super affordable. It has a chicken soup flavor almost, but it’s a rice dish... Definitely convenient, easy to make, and can be dressed up with other seasonings if you like. I used to buy this all the time, and I fondly remember the quick dinners I would make with Knorr Rice Sides. Now I prefer to make a legitimate rice dish from scratch, but this is still a good & cheap option.